CYPRUS CLOSED ITS banks earlier this week to avert a run on savings and secure a bailout for its near-bankrupt economy – but the move has dealt another blow to companies already hit by the global financial crisis. “We cannot buy, we cannot sell,” said Costakis Sophoclides, the director of a frozen goods company who usually goes to banks in order to pay his suppliers. “A lot of my customers are hotels and restaurants… and we cannot supply them… I have 25 employees now but next week I will have no products in my stores. “What will happen? We don’t know when we will get paid and if we will get paid,” said the businessman whose products are imported from Europe, including Germany and the Netherlands. Exactly one week ago, after about 10 hours of negotiations, the eurozone and the International Monetary Fund agreed to provide €10 billion to bail out Cyprus. But under the deal, Nicosia had to come up with €5.8 billion of its own by imposing a one-off levy of between 6.75 and 9.9 per cent on all bank deposits, sparking outrage among savers. 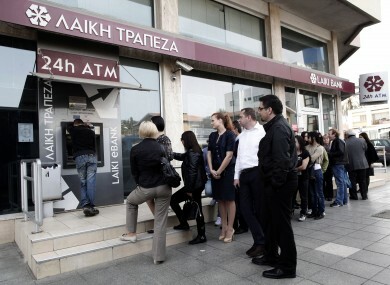 With banks closed on Saturdays, Cypriots panicked and rushed to cash points, some of which were depleted within hours over the long holiday weekend before being refilled on Tuesday. Banks have been shut for eight days now and will stay closed until Tuesday, the finance ministry said. A statement said the closure was “deemed necessary, on grounds of public interest in order to ensure financial stability” in Cyprus, where next Monday is a bank holiday. To prevent a run on the banks, the Cypriot authorities have also blocked online electronic funds transfers. The authorities are also working on legislation to restrict the outflow of cash from the country once they do open their doors again, and splitting the sector into good and bad lenders, state radio reports. “I can’t make any transactions with my account,” lamented Gatienne Thibaut, who runs a French restaurant. “I will lose the confidence of my suppliers in France. They’ll say ‘Even if she wants to pay me, she can’t’. We have been taken hostage when we have nothing to do with it. “I used to have 15 employees for many years and today only two, and they work half days. We are just trying to survive. Co-operative Societies chief Constantinos Lyras said the closure of banks is crippling the Cypriot economy. “The more days the banks remain closed, the more the uncertainty increases,” he told the official CNA news agency. Although shoppers have been able to use credit cards for purchases at supermarkets and fuel stations, some institutions are beginning to demand payment in cash. This was the case in at least one cafe in the city centre, where many shopfronts are shuttered and plastered with “For Rent” signs. In addition, petrol stations were also accepting only cash payments, Stefanos Stefanou, head of the association of service station owners, told the Sigma private television channel. The Cypriot economy had flourished since the 1990s, but contracted by 2.3 per cent in 2012. Email “How the Cyprus bank closure is crippling business on the island”. Feedback on “How the Cyprus bank closure is crippling business on the island”.